Anna Hansen’s fusion cooking blends the best of sustainable, British, seasonal produce with unusual flavours and textures from around the globe. Mentored by Peter Gordon at his groundbreaking Sugar Club restaurant in the 1990s, she now heads her own successful eatery, The Modern Pantry, where her eclectic, creative cuisine shines. Born in Canada to Kiwi parents – a mother of Danish origins and father with Belgian-Swiss heritage – she was raised in New Zealand by an extended family who prized respect for ingredients, homemade food and culinary creativity. Spending “many happy hours” in the kitchen of her grandmother, a Danish immigrant who adapted her country’s recipes to the available ingredients, she grew up with vegetables growing in the back garden and chickens laying the family’s eggs. A weekend job at a deli in Nelson, New Zealand, was her first cheffing inspiration, working as she did for “an incredible Kiwi chef”, Jill Stevenson. A degree in business management followed, but it was a spell travelling that saw her arrive in London in 1992. 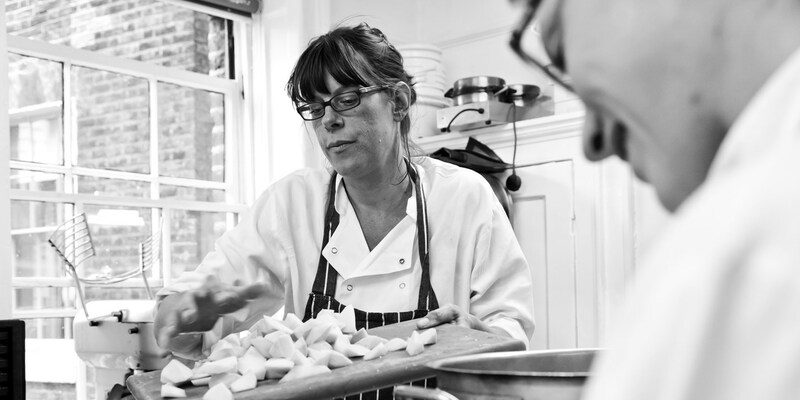 Ending up with a job dishwashing at Margot and Fergus Henderson’s first restaurant, the French House Dining Room, she excelled at her work and the food prep that went with it, and was offered a step up when another chef left. They offered to train her – “they were so trusting, caring and nurturing” – and within six months she had been left in full control of the kitchen while they went away. Moving on to work with the legendary fusion chef Peter Gordon – also hailing from New Zealand, she experienced a completely different kind of kitchen. Working with Gordon both at Green Street and The Sugar Club, she tells The Staff Canteen “with Peter, it was literally: let your imagination run wild … it was also really scary because I had become really good at cooking with a small number of dishes but I didn’t know how to incorporate all these different flavours; Peter was the master at that. And he was really good at making me not feel nervous and to trust my instincts about flavours.” Gordon was another supportive influence in Anna Hansen’s life – “welcoming, nurturing, spirited and generous” she told The Guardian, and she has often wondered whether her career would have been different, or whether it would have blossomed at all, without such caring and encouraging mentors. 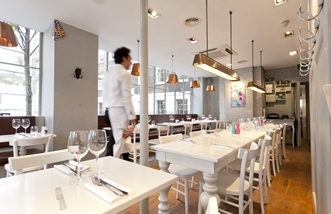 In 2001, Gordon asked Anna Hansen to join him and partners in opening their Marylebone restaurant The Providores & Tapa Room, which was Anna Hansen’s first involvement with cooking and business – the underutilised business management degree finally coming in handy. Married to one of the other partners, she stepped away from the restaurant in 2005 when that relationship ended to focus on her own project, The Modern Pantry. 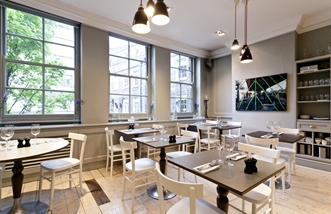 Opening its doors in 2008, The Modern Pantry is now famous for its wholly original flavour combinations, featuring the best of local, seasonal produce coupled with eclectic, bold flavours and unusual ingredients from global cuisines. In 2011 she also released an accompanying book, The Modern Pantry Cookbook, which aims to broaden the home cook's inspiration and repertoire and help them create simple but creative dishes for their nearest and dearest. But her food is also driven by seasonality “which in itself I find inspiring”. Whilst her food and flavour profiles are global, the produce she uses in her restaurant is very much local and she is dedicated to sourcing sustainable supplies. Featured in Coco, Phaidon’s book on who to watch in the culinary world, she says her restaurant is “sustainable in whatever way we can be, from traceability - who we buy our fish from - to how we dispose of our waste. Everything is recycled if at all possible. So it is really important to us and something we are working on constantly.” The Modern Pantry holds the maximum three stars awarded by the Sustainable Restaurant Association. Anna Hansen is a long-time supporter of Action Against Hunger and cycled from London to Paris in 2012 to help raise funds to end child hunger. In the same year she was awarded an MBE for services to the restaurant industry. She told Easyjet Traveller: “they explained it was about succeeding as a woman, for being one of the few females to have left an impression on the London restaurant scene as a chef, I thought, I can deal with that." Anna never intended to move to England – she arrived in London for a visit in 1992 and never left. Anna's menus are far-ranging in terms of flavours, but she hates kidneys. Anna's time with Fergus and Margot Henderson at The French House had a lasting effect on her – even now, her guiltiest food pleasure is an Eccles Cake at St John.